Researchers at the Yerkes National Primate Research Center have shown chimpanzees have a significant bias for prosocial behavior. This, the study authors report, is in contrast to previous studies that positioned chimpanzees as reluctant altruists and led to the widely held belief that human altruism evolved in the last six million years only after humans split from apes. The current study findings are available in the online edition of Proceedings of the National Academy of Sciences. According to Yerkes researchers Victoria Horner, PhD, Frans de Waal, PhD, and their colleagues, chimpanzees may not have shown prosocial behaviors in other studies because of design issues, such as the complexity of the apparatus used to deliver rewards and the distance between the animals. "I have always been skeptical of the previous negative findings and their over-interpretation, says Dr. de Waal. "This study confirms the prosocial nature of chimpanzees with a different test, better adapted to the species," he continues. In the current study, Dr. Horner and colleagues greatly simplified the test, which focused on offering seven adult female chimpanzees a choice between two similar actions: one that rewards both the "actor," the term used in the paper for the lead study participant, and a partner, and another that rewards only the actor/chooser herself. Examples of the critically important simplified design aspects include allowing the study partners to sit close together and ensuring conspicuous food consumption, which the researchers achieved by wrapping pieces of banana in paper that made a loud noise upon removal. In each trial, the chooser, which was always tested with her partner in sight, selected between differently colored tokens from a bin. One colored token could be exchanged with an experimenter for treats for both members of the pair (prosocial); the other colored token would result in a treat only for the chooser (selfish). All seven chimpanzees showed an overwhelming preference for the prosocial choice. The study also showed the choosers behaved altruistically especially towards partners who either patiently waited or gently reminded them that they were there by drawing attention to themselves. The chimpanzees making the choices were less likely to reward partners who made a fuss, begged persistently or spat water at them, thus showing their altruism was spontaneous and not subject to intimidation. "We were excited to find female after female chose the option that gave both her and her partner food," says Dr. Horner. "It was also interesting to me that being overly persistent did not go down well with the choosers. It was far more productive for partners to be calm and remind the choosers they were there from time to time," she continues. 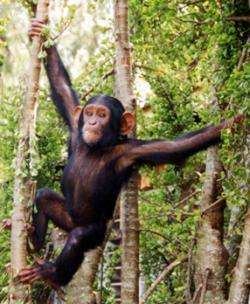 The authors say this study puts to rest a longstanding puzzle surrounding chimpanzee altruism. It is well-known these apes help each other in the wild and show various forms of empathy, such as reassurance of distressed parties. The negative findings of previous studies did not fit this image. These results, however, confirm chimpanzee altruism in a well-controlled experiment, suggesting human altruism is less of an anomaly than previously thought. The study authors next plan to determine whether the altruistic tendency of the chimpanzees towards their partners is related to social interactions within the group, such as reciprocal exchanges of food or social support. For eight decades, the Yerkes National Primate Research Center, Emory University, has been dedicated to conducting essential basic science and translational research to advance scientific understanding and to improve the health and well-being of humans and nonhuman primates. Today, the center, as one of only eight National Institutes of Healthfunded national primate research centers, provides leadership, training and resources to foster scientific creativity, collaboration and discoveries. Yerkes-based research is grounded in scientific integrity, expert knowledge, respect for colleagues, an open exchange of ideas and compassionate quality animal care. Within the fields of microbiology and immunology, neurologic diseases, neuropharmacology, behavioral, cognitive and developmental neuroscience, and psychiatric disorders, the center's research programs are seeking ways to: develop vaccines for infectious and noninfectious diseases; treat drug addiction; interpret brain activity through imaging; increase understanding of progressive illnesses such as Alzheimer's and Parkinson's diseases; unlock the secrets of memory; determine how the interaction between genetics and society shape who we are; and advance knowledge about the evolutionary links between biology and behavior. The next experiment should be testing the altruism of our future simian over lords for their human cattle. Will they give us peanuts if we make big cow eyes at them - or will they throw tihs at us? The chimps were rather mean if you read the paper. The chimps were presented with equal numbers of tokens that either gave a wrapped piece of fruit to themselves or that plus another to a second chimp. They only did this on 60% of occasions n. Statistically significant but given they could have without cost their partner fruit on every occasion hardly prosocial. The universe doesn't taste like raspberries, that's the milky way friend. Personally I expect animals with full language(us) to be more altruistic than other animals. Only with full langauge can you be more likely to get laid by telling people that you're the second cousin of the famous martyr who laid down his life for the good of us all. It's in our interests that someone else has kids with that person, so in our interests to talk them up. @hush1, no worries. I just prefer to think of the universe tasting like coal tofu with a few skittles in it. Tofu for dark energy, coal for dark matter, and our matter is the skittles! Evolution has produced Altruism because Altruism is beneficial to a species, and by extension to a group. The method Nature has chosen to accomplish this is empathy and compassion. On the eve of the destruction of the American State, I note that the lack of compassion and empathy to the controlling Republican party has been accompanies with the rapid decline of the American Nation, in direct accordance with what one would expect from the observations made in the first paragraph. How very relevant... Oh wait.